A small stream called Bear Branch, a tributary of Bennett Creek (which is a tributary of the Monocacy River) flows through the Sugarloaf Mountain Natural Area. It’s a nice place to go botanizing, despite some pretty heavy deer browse. The understory is full of mountain laurel (Kalmia latifolia). I’m slightly embarrassed to say that I’m not sure of the canopy; chestnut oak mostly, and some beech, but I have a bad habit of looking down when I should be looking all around. Anyway, the more or less flat area where the two forks of Bear Branch meet, by Mt. Ephraim Road, is almost swampy. Last month I noted many croziers coming up there, but I don’t know ferns well enough to identify them by their fiddleheads. By last week most were fully opened into tall fronds, and some had fertile fronds as well. 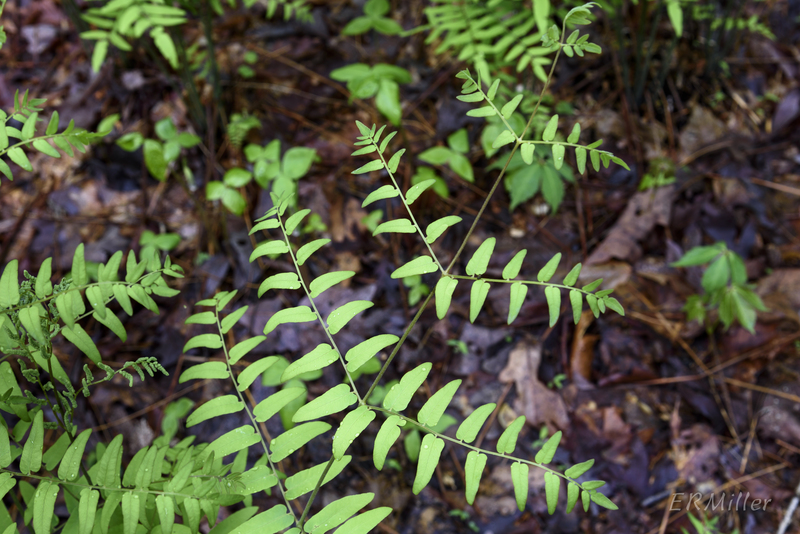 Fertile fronds make identification much easier. All three of these species are in the Osmundaceae. All three have similar ranges, mostly east of the Mississippi River as far south as Georgia and north well into Canada (cinnamon fern ranges further into the southwest). 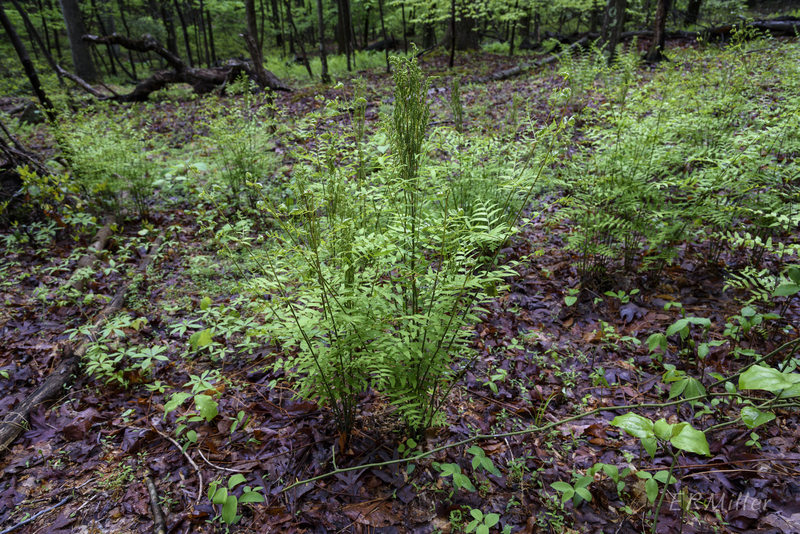 All three are tall, clump-forming ferns of wet places, and all three have distinctive fertile fronds. 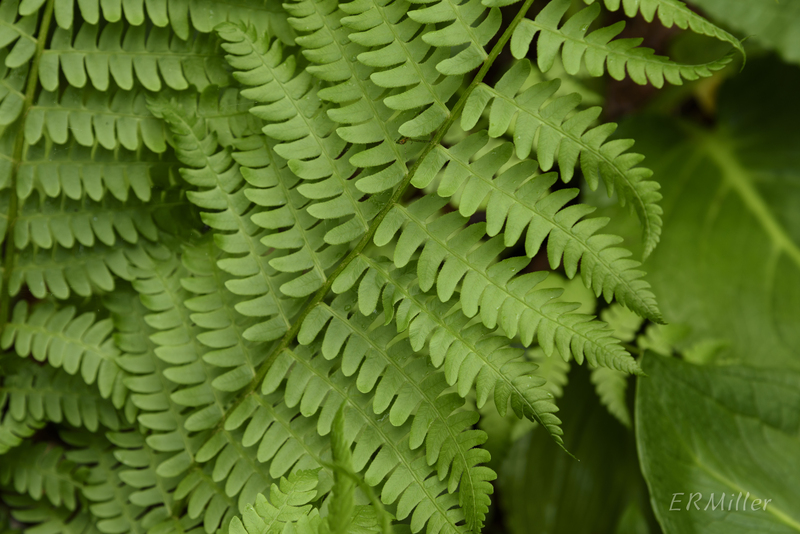 Royal fern has an unusual look. 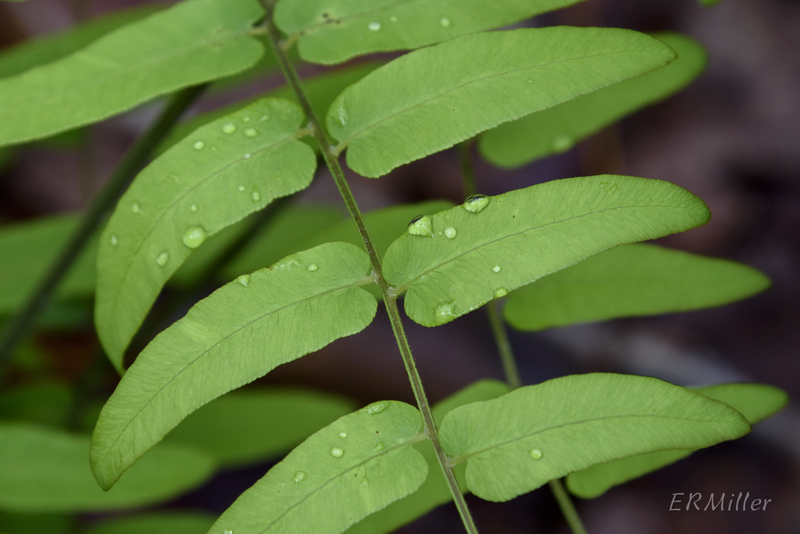 The pinules of the bi-pinnate fronds are simply-shaped and widely spaced along the costa, giving the frond an open, airy appearance. 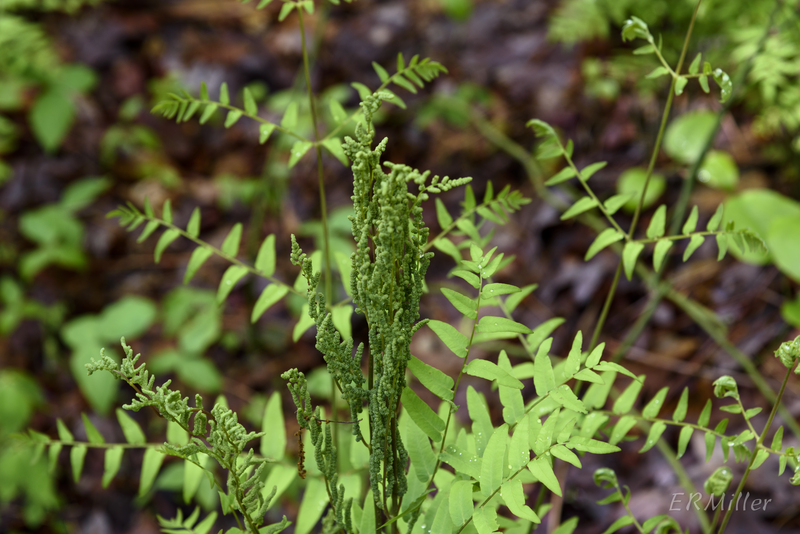 Royal fern is commercially exploited in Florida, threatened in Iowa, and exploitably vulnerable in New York. 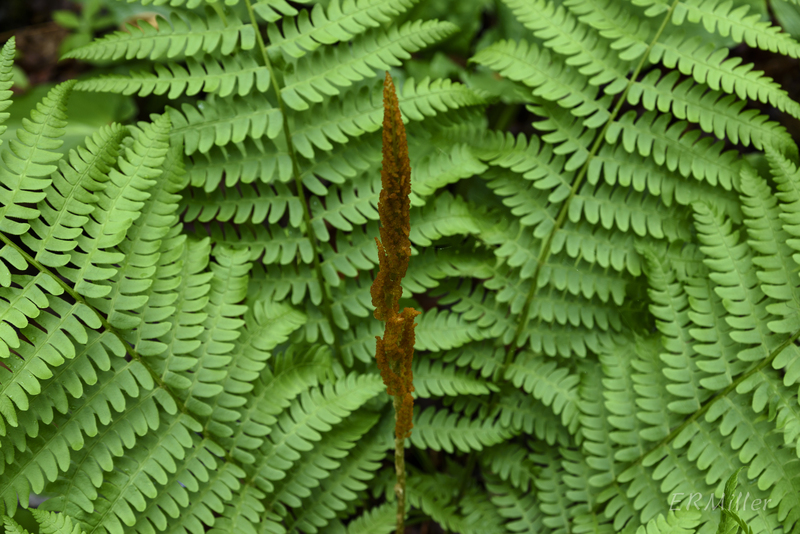 When fertile fronds are present, cinnamon fern can’t be mistaken for anything else. You can see how it gets its common name (and specific epithet) from the fertile fronds, borne separately from the sterile fronds; when mature, the sporangia turn brown, giving the look of a cinnamon stick. 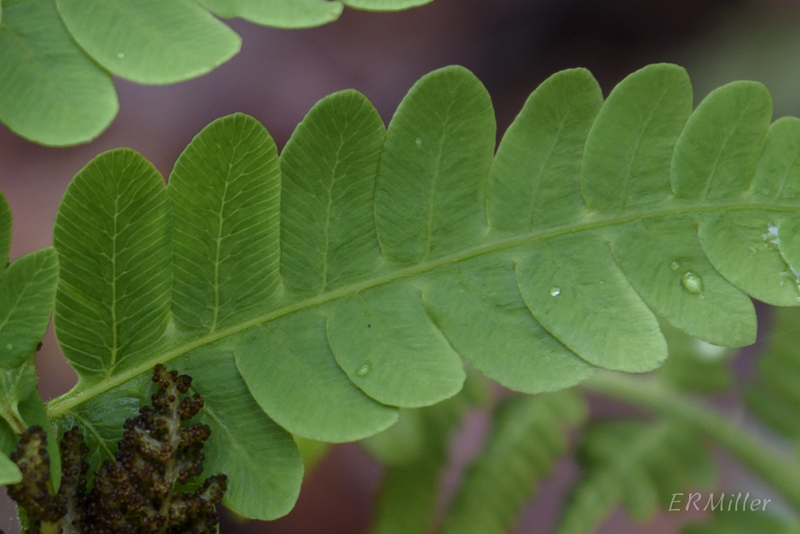 Cinnamon fern is commercially exploited in Florida, endangered in Iowa, and exploitably vulnerable in New York. It’s commonly available in the nursery trade, and is a great landscaping plant for a large, shady, wet part of the yard. 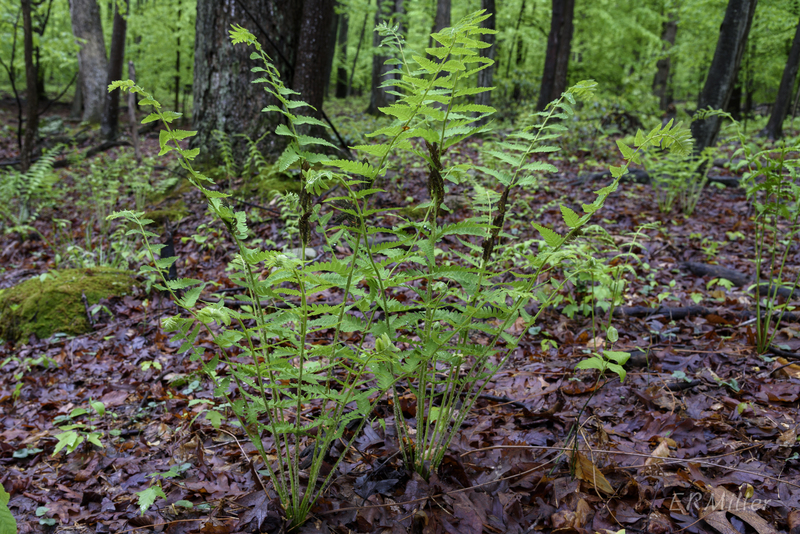 As with cinnamon fern, the fertile fronds of interrupted fern make identification easy, and you can see how it gets its name. The sporangia (green when young, tan or brown when mature) cluster on the rachis between the pinnae. This fern likes wet places, but not as wet as the previous two. Each species I found growing in distinct stands in the same general area, but well apart from each other. The interrupted fern was significantly further uphill, on a bit of a slope in a slightly rockier area. Interrupted fern has pinnate-pinnatifid blades. It’s threatened in Arkansas and exploitably vulnerable in New York. 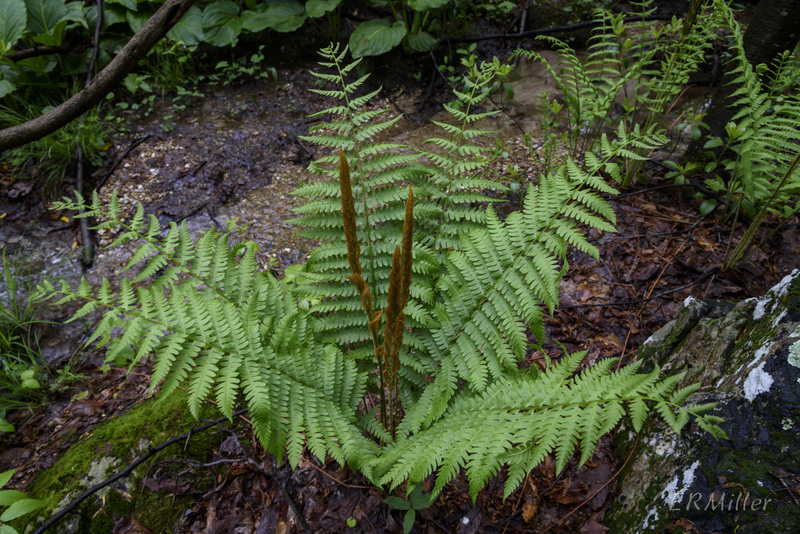 This entry was posted in Uncategorized and tagged cinnamon fern, ferns, interrupted fern, Osmunda, Osmundaceae, Osmundastrum, royal fern, Sugarloaf Mountain by elizabeth. Bookmark the permalink. 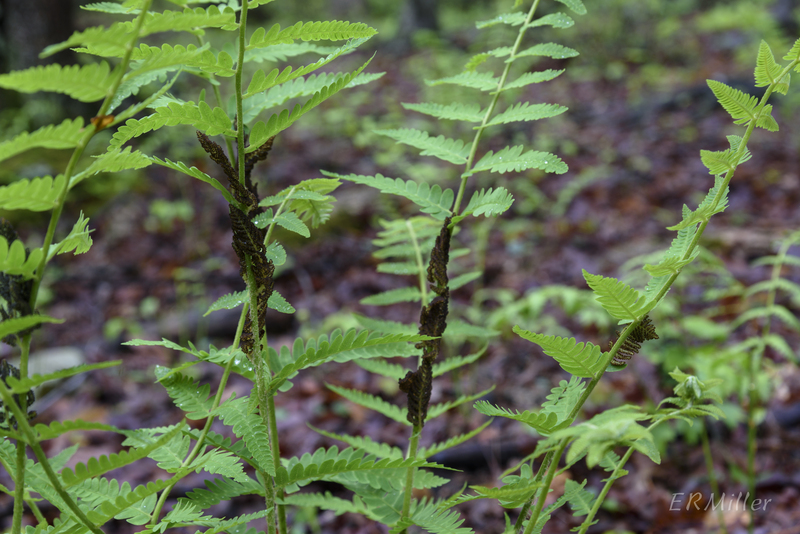 It’s kind of maturity that turns the fertile parts of these three Ferns brown, but not exactly. This Family of Ferns have spores which contain chlorophyll. As the spores are released the fertile areas change from dark green to tan or brown. When you’re collecting spores from this group of Ferns, if the fertile parts aren’t green, you won’t get any spores; they’ve all been released.